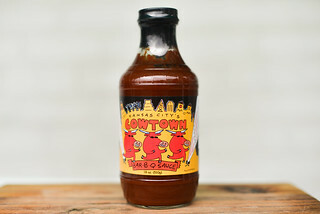 A base of sweet tomato gives this vinegar sauce a balance that lessens the extreme tartness and heat that defines the average Carolina-style sauce. 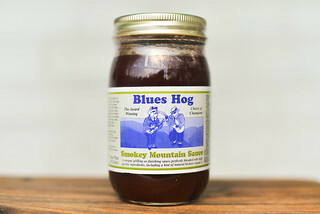 Joe Flanagan is the namesake and creator behind the line of Joe Joe's Hog Shack sauces. 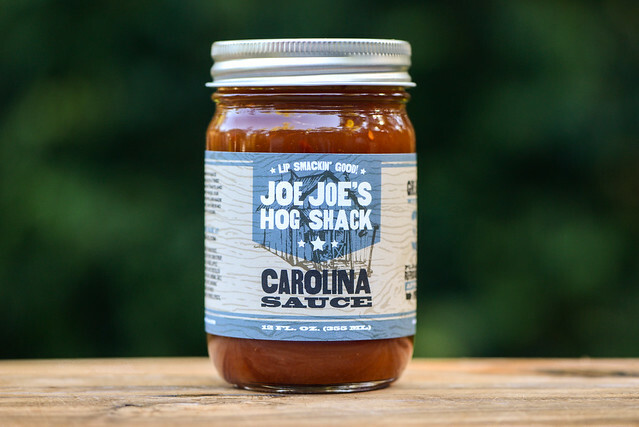 His story treads familiar ground—Joe had an interest in barbecue that led him to create Joe Joe's Hog Sauce, the precursor of what is now his "Carolina Sauce." This hobby turned into a passion, which drove the development of additional recipes and take the step into larger production, bringing his son-in-law, Brian Ellis, into the fold along the way. The company, which is run out of Glenwood, Maryland, is still fledgling, having only started earlier in 2016, but currently boasts a line of three unique, small batch sauces available to order. The aroma of this sauce is reminiscent of hot sauce with a bit of sweet ketchup mixed in. It's heavy on the tartness with an equal earthy heat that combine to impart a bit of tingle on the nose. Unlike a hot sauce though, it's not enough to illicit a sneeze thanks to the underlaying sugar and fruity tomato that dampens the impact of the pepper and vinegar. This smooth, bright orange sauce is semi-transparent, making it easy to see disparate large specs of chili peppers and their seeds. Its consistancy sits just below medium-thin, resulting in a very fast, even, watery pour from a suspended spoon that leaves only a slight coating of sauce left clinging to the silverware. The first taste of this sauce is oddly neutral and flavorless—it seems almost like the intense elements of vinegar, sugar, and spice cancel each other out. As the sauce settles though, a mild sweetness makes an appearance first, followed quickly by fruity tomato ketchup. Then the tartness hits, and while it's prominent, the sweet ketchup remains and strikes a balance with the vinegar. Finally, just the slightest taste of an earthy pepper makes its way in before its heat dominates and leaves a tangy burn as an aftertaste. The sauce coated the chicken leg in a thin, even layer that baked down well and gained heft after multiple brushings over indirect heat. When moved directly over the fire, there was minimal caramelization with no burn off. The sauce gained a bit more flavor after being cooked thanks to an enhanced presence of the sweet ketchup. This came at the expense of the spices though, which were difficult to discern in this pretty two note—sweet and tangy—flavor profile. 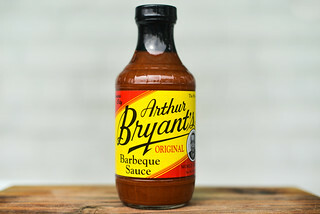 If a sauce is clearly labelled "Carolina," I know its meant to be used as a condiment and not so much for grilling, so this sauce left me a little surprised to find it having a more pronounce flavor after being cooked. Out of the jar, I felt the sauce was well balanced to a fault—it lacked the intensity in tang and spice that makes a Carolina sauce function in top form on pulled pork. Instead I tasted a sauce trying to play nice between the flavors of Northern sweet tomato and Southern tartness, leaving it not preforming the jobs of either to its full potential. 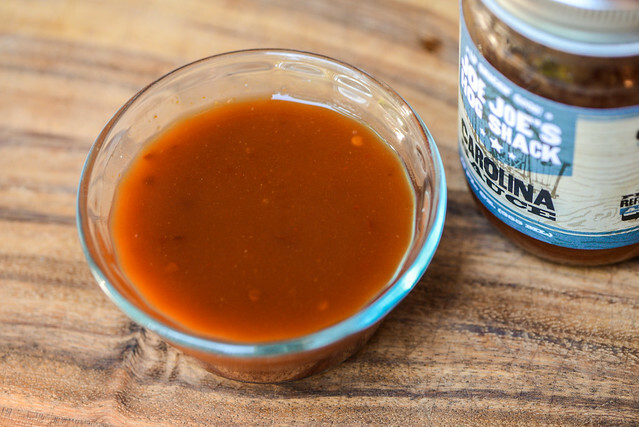 The ingredients are quality and the flavors straightforward and clean, but in the big game of barbecue sauce, I've tasted a lot more striking sauces that would make my pulled pork stand out more than this would, not that this sauce would do it any harm. 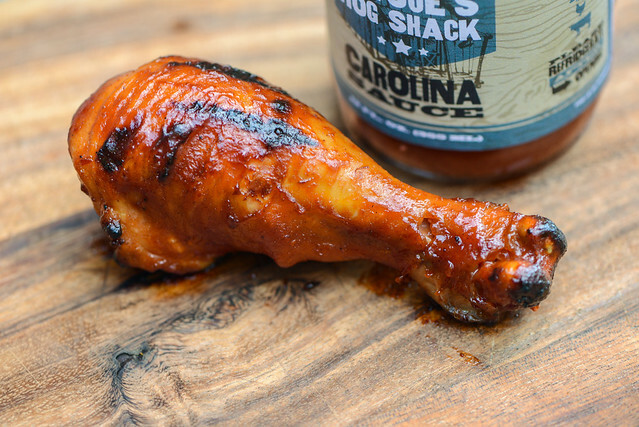 It's getting close to Thanksgiving and I'm sure we'd all be thankful for a bottle of free barbecue sauce and a bottle of Joe Joe's Hog Shack Carolina Sauce could be all yours. If you'd like to be entered to win the sauce, all you have to do is comment on this post with the thing you're most excited to grill, cook, or eat this Thanksgiving. Deadline for entries is 11:59pm on Tuesday November 22, 2016. Read the official rules for more details. One entry only per individual. Good luck! I'm not cooking this thanksgiving (going to vegas), but I plan to make up for it with some confit turkey thighs for christmas. My 22 year old daughter is doing most of the cooking this year. She decided to give her old man a break this year. I'm very eager to see how much she's paid attention over the years. I know I won't be disappointed. I am looking forward to the turkey leg.